Tiffany's Online Finds and Deals: Serta Massage Recliner with Dual-Motor Massaging ONLY $179 REG $399! Serta Massage Recliner with Dual-Motor Massaging ONLY $179 REG $399! Anyone else know someone who has been hinting around about a recliner for Christmas? This generously sized Serta Massage Recliner will give you maximum relaxation after a long day of work. The recliner comes with built-in multi-setting dual motor. It provides a relaxing back massage with the touch of a button. 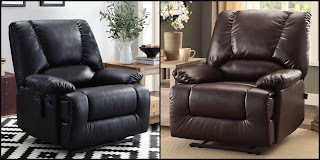 The easy fingertip actuated recline control adjusts the seat back to your desired level while you are watching movies, reading or taking a nap. Its unique cut and sew comes with filled soft pillows on the seat and back to accommodate your lumbar area and provide extraordinary support and comfort. This black premium fabric will fit in many types of home or office decor and will be a classic piece of furniture to add to your space.